Hello, my friends Lisa here with you today. It’s May 30th and Memorial Day. Today we are remembering all the heroes that gave their lives so selfishly in service to our great nation. 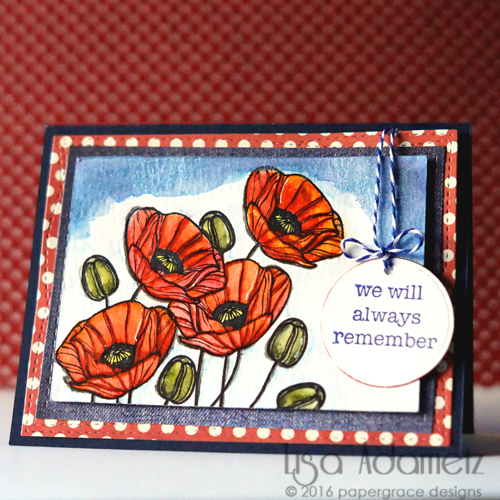 Poppies hold a special significance for Memorial Day. My card is a simple tribute to those who served our country and fought for our freedoms…and paid the ultimate sacrifice. We will NOT forget you. 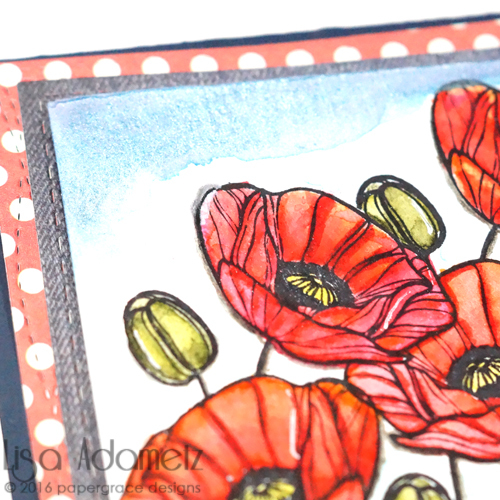 I stamped the flowers, masked one off and stamped again to create a more “clustered” look and then used Distress Markers to water-color them. Using the Distress Markers again I created the background. At the top I used water and blue Pigment Powder to create a shimmery “sky” effect. The panel was trimmed to size and two pieces of patterned paper were die-cut. The water-color panel was adhered to the first piece of patterned paper using 3D Foam Squares – White, Regular. 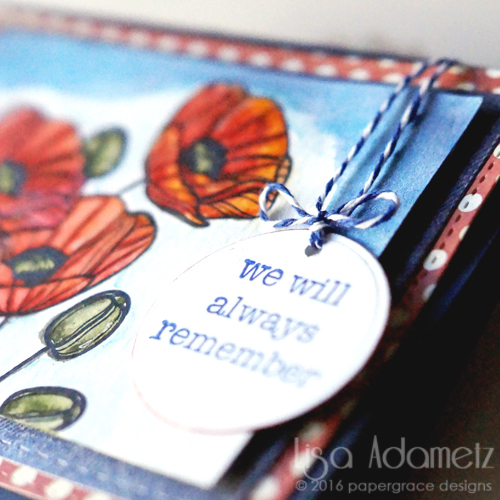 A small scrap of paper was stamped with the sentiment using Archival Ink in Cobalt. The scrap was die-cut into a small circle and a hole was made near the top..
Navy Twine was looped through the hole created and a small bow was made. A Dodz Mini was adhered to the back and it was attached to the front of the card. Using the E-Z Dots® Permanent Refillable Dispenser, I added adhesive to the back of the water-color panel/patterned paper piece and attached this to the second die-cut patterned paper. HOWEVER…just before completely adhering, I tucked in the ends of the twine from the sentiment circle. This piece also got the same adhesive and was attached to a 4¼” x 5½” Navy base card. Whatever you are doing today, I hope you take a moment to pay your respects. This entry was posted in 3D Foam Squares, Adhesive Dots & Lines, Adhesives, Cards, Crafts & Tutorials, E-Z Runner® Dispensers and tagged 3D Foam Squares Regular White, Adhesive Dots Mini, Bazzill Basics Paper, Card, Chickaniddy Crafts, E-Z Dots Permanent Refill, E-Z Dots Permanent Refillable, E-Z Runner Grand Permanent Dots Refill, Fancy Pants Designs, Lisa Adametz, Memorial Day, My Favorite Things, Patriotic, Ranger Ink, Technique Tuesday, Twine. Bookmark the permalink.